Families looking for safety, value, and comfort can find them in the largest vehicle Subaru Corp has ever built. It’s built in America for U.S. and Canadian families and it’s not sold anywhere else around the globe. The Ascent family hauler just picked up another award, this one coming from AutoTrader who named it one of the Best New Cars for 2019. Ascent shakes things up in the 3-Row segment. The 3-Row Ascent tops out in safety and earned the highest possible ratings from the Insurance Institute for Highway Safety (IIHS) in all crashworthiness and front crash prevention categories. It should be no surprise Ascent gets the highest safety rating because Subaru touts safety as being one of their core values. The Japanese automaker has six other TSP+ award-winners, and can now boast they have seven with Ascent. You don’t have to spend $40,000 to get a large family SUV. Ascent has a starting MSRP of $32,970 for the base model making it one of the lowest priced 3-Row SUVs in America. The Ford Explorer Limited 4WD starts at $45,235, Toyota Highlander Limited FWD ($43,325) and Honda Pilot Touring AWD ($44,865). The well-equipped Subaru Ascent Limited still comes in lower at $39,970. (all pricing includes destination). 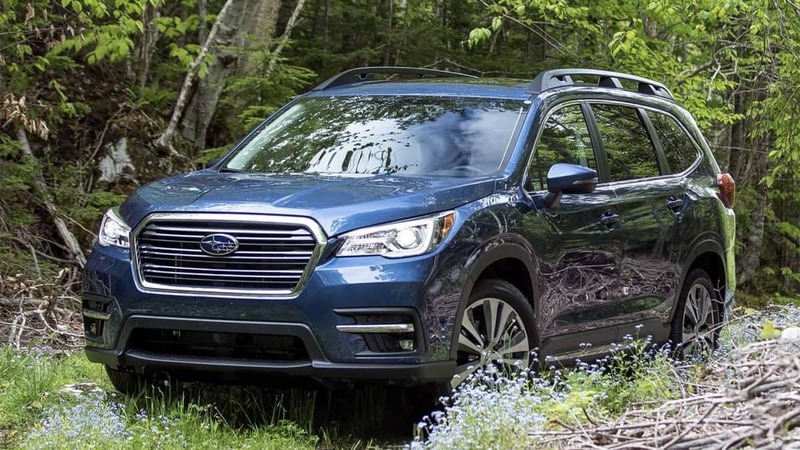 The base Ascent trim comes standard with Symmetrical All-Wheel Drive with X-MODE, three rows of flexible seating for 8 passengers, standard EyeSight driver assist technology, Subaru STARLINK Multimedia with Apple CarPlay and Android Auto, raised roof rails, and 18-inch alloy wheels. What used to be a weakness for Subaru, the new 2019 Ascent family hauler turns into a strength. The 2019 Subaru Ascent Touring trim makes it as a top-ten best interiors nominee by Wards Auto. Subaru interiors were the weak point for all their cars but not anymore The brand has come a long way since they had more hard plastic inside than anything else. Subaru interior materials were cheap and the fit and finish were poor. Those days have changed with the introduction of the Ascent Touring. The Ascent is the biggest and now the most luxurious vehicle the brand has ever built. They needed to get it right after the failure with the Tribeca 3-Row. “We are extremely proud of the all-new Ascent,” said Tom Doll, President, and CEO, Subaru of America, says “Our goal was to create a family vehicle made to Subaru’s highest standards of safety, comfort, and value.” AutoTrader just named the 2019 Subaru Ascent as one of the Best New Cars for 2019. It looks like the Japanese automaker reached their goal. I had the opportunity to be taken for a ride just yesterday in a brand new (200+miles), beautiful blue Subaru Ascent. (I have the smartest and most generous neighbors ...:>) It is a magnificent accomplishment. It is a magnificent vehicle. The owner's manual package weighs almost 5 pounds! The ride is very pleasant. It has bells and whistles as well as USB ports and "bottle holders". I heard 19 cupholders hidden somewhere. Quick, smooth, warning devices, incredible back up camera view ... can't say enough. Now I want one.